Tomorrow supper @ the parents house... yum! OK, even at its most stunning, this bathtub is never going to win any beauty contests. But at least it's clean. This is AFTER me spending a whole hour yesterday afternoon scrubbing every single inch of grout between the tiles. You already saw the BEFORE shots in the kiddies' bathtime pictures I posted from Ted's camera last week. Ugh. Two kinds of mould - pink and black. Ugly, ugly. Anyway, the slime has been scrubbed away, to reveal the inner... whatever... of this bathtub. Here's the remains of the paint the previous owners painted the tub with to make it look like a real bathtub and not the mutant leprous bathtub it truly is. Ew. These lines look like "lines of cleanliness" where bleach or some super-strong cleaning agent has dripped... but I have been unable to recreate the same degree of whitness elsewhere on the tub surface. The soap dish was almost all pink with slimy pink-mould, whatever that stuff is. Now it is clean & white. There are still a few speckles of black mould at the top corner where I was unable to reach... but it's BETTER. Way better. Speckles on the towel bar are NOT mould - just flaking paint. Now I have to phone Sears Yorkdale because I have a hunch they are NOT going to show up between 12-6 as promised. Naomi, drawing a person at the table... "mommy, look - I made wings and it's a sibling [pronounced "sibbi-ling"]"... I almost asked "is it a brother or a sister?" when she added, "...and it's a baby goose." The last post had such a blah and unflattering picture, here are some decent ones - Ted took them - to make up for that awful shot of the bathtub. Can't believe she's old enough for bead-stringing! These are super-cheap beads courtesy of the treasure box at the dentist, where Naomi sat SOooo nicely while the hygienist "counted", then polished her teeth. Now we have to floss her, every single night. Ugh. She now wears her new necklace every day. Here she is in the carriage on the way to Bubby & Zeidy's house tonight. And the mandatory camera-bag-chewing shot. Poor baby has NOT been himself today at all. He's having tummy problems, I think... pretty burpy and not eating normally. Not that he's usually voracious these days (as opposed to three months ago when I had hoped to exclusively breastfeed him), but he refused just about everything except straight bread. In this shot, Ted had to take him outside from my parents' house because he would not sit calmly inside - he was doing nothing but crying and whining, in every possible position and configuration (high chair, lap, standing, sitting, nummies, food, drink). OK, he was quiet for a second while he drank water from a glass, most of which ended up in my lap. Anyway, outside proved to have lots of distractions, including dogs, which he's totally into these days. And he went to sleep okay... let's hope they both stay that way all night long. Zzzzzz... did I mention Ted's off work tomorrow? YM's going to the yeshiva, aiming to be there for 9-9:15 ish. So it should be a pretty mellow morning. Elisheva's the only one on any real kind of deadline, and even then, it's the last week of school - pretty much a joke. Yes, that's right: she'll be a Grade Eight in a few days. Shhh... bought this book for Mary. The beauty of ebay is that I can just have it shipped directly to her - I don't even have to leave the house to go to the post office. The downside is I don't get to make sure it's in decent condition, but anyway... how bad could it possibly be? (otoh, it's a 1971 edition; maybe I should have inspected it here first... hmm...) Oh well! ~ wall - not sure what I meant by this! ~ freezer (new) - hey! this one's actually fixed... we have a new small chest freezer in the basement humming away. Yay! ~ summer vac - vac = vacation; you don't think I'd actually vacuum, right? ~ weight - that's my weight, in case you're wondering... baby weight, right? Don't you love the sticky blood-looking smears & messy crinkles of the page? I forgot I wrote this and we wrote out shopping list this week on the other side. I love having a shopping list, btw... fairly new development in this family, like maybe 2 years. 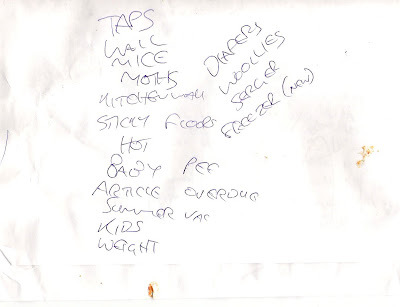 No idea what we used to do before shopping lists! Ted says "we used to buy the same sort of stuff all the time." Oh, he just said "we used to run to Dominion a lot, I think." Well, whatever we used to do, this way is better. Ted's finally making the Nanaimo Bar mix he bought a few months ago. I refused to touch it because it's so potchkedik (3 steps), and besides which, it doesn't save any time or anything making nanaimo bars from a mix!!! You still have to mix the base, press the base, wait half an hour, mix the middle, spread the middle, wait half an hour, mix the chocolate, spread the chocolate, wait and wait and wait. It's not like you just mix, pour, bake and eat. I do love the fact that you're supposed to make it in an 8 x 8" square pan... and then it says on the box in big letters "makes 40 bars!" Have they ever seen an 8 x 8 pan? You can't get 40 of anything out of those things! On the side it reveals that the so-called bars are 1x1.5"... umm, I wouldn't call those bars, I'd call them morsels! Nanaimo "morsels." "Here's your whopping inch o' Nanaimo-yumminess." OK, end of rant. Going to either watch Good Morning Vietnam or wash the dishes - or both. Stir fry - onion, red pepper, celery... pretty basic but yummy with sesame oil, seeds & tamari. Would have been a main dish if we'd had tofu or chicken here. Look what Ted made for me!!! After over 3 years in this house, at last, we have backyard drying capability. There is still one pulley thing that needs a rope so the close-to-the-house end can be raised and lowered, but I am SO happy to be able to raise the serviettes up the flagpole as shown here. Dunno how sturdy the line itself is - it's the original one and cracked in many places but seems to be holding up okay so far. Is it a fish supper? A pasta supper? A garden-lettuce supper? Yes, you read that right... fresh, fresh lettuce straight from the backyard square-foot garden!!! This was last night - Wednesday. As for tonight, I have NO CLUE... waaah! The Moby is gone... I sold it yesterday for $35 along with a fleece pouch I never ended up using for Gavriel Zev. SO sad... this was definitely my favourite newborn babywearing thing, although the Ergo is it for all-around sheer comfort & usefulness. It was hard HARD parting with it because of all the cuddly memories it carried. The bloody dryer was about an inch too big to fit through the laundry-room door. Umm... hey, guys - next time you're moving appliances into an old house, howboutcha measure first?!?! We told Mary (aka the laundry machine fairy) that at least one dimension must be 27 inches or smaller to pass through the door, and she says she went to the Sears store in Calgary with a tape measure, and they stood around measuring the machines until they found one that was perfect. So I dunno what happened. She thinks maybe they "upgraded" us somehow, secretly. The guys were pretty abrupt about it, too, like "decide - NOW" whether they should leave the dryer just sitting in the basement or take it back with them. Guess they were po'd but, like I said, measure first! I am eager to test the new washing machine BUT a) I'd have to hook it up myself and b) it looks like it could rain any second. So maybe I will run a load through just to see what it does! PIZZA - homemade herby crust, double-recipe because Elisheva's friend Shula is coming. Not whole-wheet, but still hopefully yummo. Dunno what cheese, though, because there's only half a stick of Mozza in the fridge. Lots of cheddar, but that seems like sacrilege (even though all kosher cheese tastes the same to me...). These swingin' action pictures were taken by Ted's slightly-better-than-mine Sony camera. I love Naomi in the action shots! ~ Homemade, handmade, from scratch, FALAFEL! Note to self: Mrs ViKi wants the falafel recipe... oy, now I have to make something up! How can I break it to her that it's really just a couple of tins of chickpeas with cumin mixed in??? I'm thoroughly hooked on Recipezaar these days. The site is not fabulous, but the reviews are a tremendous plus - I figure 80 people who have left four-plus stars plus comments can't be utterly and completely off-base. Other recipe sites just leave you guessing and taking the author's word for it that a) there are no typos in the recipe, and b) the recipe will end up tasting great. I really like the idea of a site that lets you post and read reviews, for recipes in particular. Oh - except Elisheva made white-chocolate chip cookies with all butter, yum, yum, only then when they baked they all spread together and THEN, when I was trying to slide them off the parchment onto the cooling rack, well the whole sheet of cookie(s) crumpled onto each other so it's basically a pile of cookie shards. At which point she screamed at me about how I was lazy and mean and awful, and I did feel awful for wrecking her cookies, but I sent her outside for her rudeness anyway. I apologized properly when she came inside, not that she noticed. We went to see Don't Mess with the Zohan. Dumb movie, so it figures zero-IQ me laughed and laughed and laughed the whole way through. Funny, funny, funny. What a lousy premise - Adam Sandler speaks in a bad Israeli accent for two hours while tossing clichés around like smelly boomerangs. Somehow, it aaaaalmost kinda works. A few years ago I came to the startling realization (startling unless you've heard it a thousand times) that I NEVER NEED TO WAKE UP IN A TENT EVER AGAIN. Ever. I am 38 years old and I have been there, done that. I already know what it's like and, for me, at least, it will probably never be the wonderful, exhilerating thing it is for people who like camping. Tents are dank and sticky and sweaty and full of spiders. My bed at home is warm (or cool, with the a/c running!) and soft and just the way I like it, thank you very much. I will happily hold down the fort here with the baby this year and cherish the walls around me and the roof over my head. Oh, plus there's standing up to cook... and sitting down to use the bathroom. So no Awenda. But it's cool that they're going, and great that Naomi will have friends she knows there, particularly because Elisheva will not be going this year. I guess our team will have lots of 'splaining to do about our whole Shabbos camping thing... Tomorrow, the Washing Machine Fairy comes to visit. I am so excited. Laundry room's been cleaned out & swept in preparation - looks fabulous. Ted just asked, "are you writing something about those photos?" No. Duh. Little does he know... why am I so secretive? Why do I feel like minimizing everything the second someone looks over my shoulder? Eek. Guess I'll never know. Tired potatoes! Up at last - actually, they've outgrown the first layer of tires... this picture was a few days ago already. Grama's frying-pan FUDGE, mmm... Elisheva's out buying Jello cooked pudding mix - it's getting harder and harder to find. Cheese, Ted's buying bagels... you know, dairy stuff. I bumped into an old friend of YM's from Netivot last week at Sobey's. He was in the cheese section, looking for Ricotta. He was on the phone and aaalmost towered over me (ok, maybe around my height) with that awkward booming voice all the boys have. And I just had a pang of "oh - so this is what we're missing." But other days, I am so, so grateful for my weird but wonderful never-grows-up little boy. Ted says he'll catch up eventually, like when he's 25. Can't hardly wait. Must go cook some of that yummy Shabbos stuff! P.S. I have no idea what the rhyme in the subject line is supposed to mean. Yay, Elisheva's home - hope she brought pudding mix! Probably mirrors the mood / attitude she's getting from me. But I don't know if I can help it! Aaargh. We just never get a single step forward around here without about a million steps backward. There is not a single thing around this house - except maybe the garden! - that is even a tiny bit better than when we moved in. It's this unbelievable entropy: everything just decays until it explodes and needs a costly replacement. Is that the way it is with all houses? Or just the 70-year-old ones??? It's not just the house. Ted's work, too: like just when we think we're getting around the lousy pay, cruddy pseudo-random schedule, etc., they'll do something bizarre like ask him to come in half an hour early (and no, they don't let him leave half an hour earlier to make up the time - but thanks for thinking of it, like any SANE person would!). Or refuse to let him take off for the Zareinu moveathon - a family event that cannot be held on any other day just because of his lousy work schedule. Or take more than one Sunday off in a row, even to have a baby or visit his family in Ottawa. Or trade days-off with anyone else there, because apparently a few people were abusing the more liberal trading-shifts policy. How? By taking a whole month off...?!?!? How is it possible to "abuse" the privilege of rearranging your work schedule to accomodate an actual life that might include vacations with your family, surgery, doctors' appointments, children's graduations, etc?? Oh! And the late shifts that they told him when he was hired would be twice a month are now sometimes happening every single week. I get SO mad every time I think about the little ways they chip a few bucks off his paycheque here and there. Oh, also - like Shabbos. Apparently, some folks were resentful of the "early" Fridays that Ted & a few people got (never mind that this is a supposedly Jewish company with great respect for tradition - it even says so in their ads!) that they make him put in an extra half-hour each day during the week (ie Monday to Thursday) to make up the difference. I wouldn't be so mad except this was TOTALLY not the deal when they hired him... so, of course, I get all righteously indignant, like, how can they change the terms of employment. Plus now I have a cold - I hate colds! If you had had four children, maybe you would hate colds too. One reason: Bladder Leakage. I can live with the fevery woozy feeling (maybe, if I didn't have too many kids in my hair), and I can live with the runny nose, though I'm using up hankies faster than I can wash 'em these days. I've heard there are things you can do - cut back the caffeine (but I have kids! ), do kegel exercises (when not chasing the kids), surgery as a last resort...oy, I don't want to think about it. And I don't want an awful, leaky, sneezy, hotty, scratchy COLD! And then I emerge from my selfish haze every few minutes to realize that Auntie Sally is having her surgery today. Refuah Sheleima... may Hashem guide the hands of her doctors and nurses and everyone who's touching her life at this moment. Still tiny & very cold in the basement around March 11th. And now, today, blooming and lightly candy-scented! They smell like those little powdery candy hearts... weird. Any tips on saving seed - send them my way - I love these guys!!! <--- Looks mighty functional, doesn't it??? Well, think again. This washing machine is about to join its Brother Dryer in the Big Sky Appliance Warehouse of Dreams. This knob is basically good for turning ON each cycle if you don't care if the cycle advances or ever shuts off. Bad, bad, bad. Meanwhile, just a couple of garden highs! Potatoes! These lovely specimens are purple potatoes and the shoots & leaves are darker than the standard Yukon Gold ones. I planted these in the "scrap heap" area by the back door, then let Elisheva toss some cosmos seeds on top thinking it would pretty up the little patch... but I have no clue how I'm going to hill the soil up around the 'tatoes without killing the cosmos. Very, very carefully, I guess! 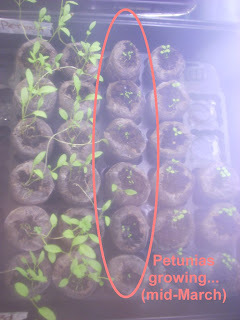 And, then, of course, my pretty-as-a-picture petunias, grown from seeds in the very, very early winter. 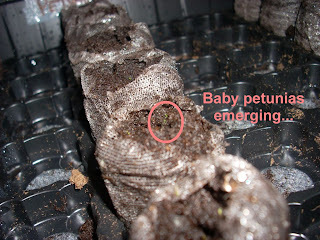 Maybe I'll try to find pics from when they sprouted to give some perspective as to how far they've come in their short little lives... Anyway, they are lovely, and like I said last night, faintly candy-scented. I wonder how I'd go about saving their seeds?? ?